After pressing start, you'll drop onto a highway. Now is the time to start practicing your rapid shot. Press ???? repeatedly to maintain a steady barrage of projectiles. These shots not only damage your enemies, but keep you protected, for a perfect offense eliminates much of the danger. As you make your way to the right, you'll notice cars driving past. Ignore the cars because they will distract you when the first enemy appears. Immediately after the last car, a Spikey will be moving towards you. These types of enemies take three shots to destroy. If they are nearly out of health, they'll spin sideways and fall over in a ditch effort to inflict damage, then self-destruct. After the Spikey, your path will be blocked by a Gun Volt. These hefty enemies are much more durable in comparison to the smaller Mechaniloids, as they take many more hits from your Buster before they die. 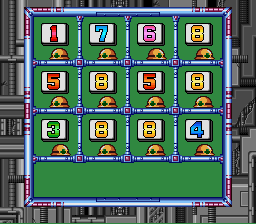 The easiest way to defeat these is to make sure you're firing a barrage of projectiles as soon as you see it. If you do, you can kill it before it has time to fire, or just after it does. Gun Volts have two attacks: forward firing missiles, or ground crawling electric orbs. Be wary of the electric orbs because they will follow the outline of the broken highway. Jump the gap, then get ready to face several Crushers, flying enemies that carry spikes underneath. When you destroy them, they drop their spikes. If the spikes land on a part of the highway that is vulnerable, it will destroy it. You'll notice that if enough of the highway breaks away, a gap can be created. Also notice that the only breakable parts are between the poles that support the highway. The sprites for those sections (they are square and sometimes have a street lamp on them) are invulnerable, so if you time your kills correctly you won't have to worry about falling or jumping around uneven terrain. 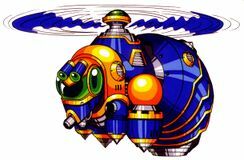 With the sound of helicopter rotors chattering about, you'll lay eyes on the first sub-boss of the game as it descends from the sky. You'll then face off against a giant mechanical bee, which is called a Bee Blader. This is a guerrilla warfare helicopter Mechaniloid that is built to transport Ball de Voux, mechanical walkers with spheroid bodies. It's suited for missions in a forest or a city, where it can do a flyover and bombard its targets with heavy flak or deploy its Mechaniloid cargo to keep its enemies occupied, while it takes them by surprise. The sub-boss can fire its machine gun turret to keep you from getting close, launch guided missles toward your position, or drop Ball de Voux enemies to assist it. The Bee Blader looks nasty, but it's a simple foe to battle; simply run to the left side, then make short hops and fire charged shots level with the Bee Blader (simply put, repeatedly tap ???? + ???? ). As it sustains damage, it starts inching toward you, closing the gap, but it will die when it nears the middle of the screen. The giant Mechaniloid will fall down and its heavy body will crash into the road with enough force to destroy the bridge. The highway will cave in under you, so you'll have to wall climb the right side to get back up. You can also pick up some energy capsules by jumping down into the next pit. Continue on and you'll face some Ball De Voux (they only take two shots, so just make sure you hop to get them quickly) and another Bee Blader. This one is a bit more agressive with spitting out Ball De Voux, so keep shooting away to prevent them from getting too close. Notice the dust underneath: this means it is about to crumble and fall, so move out of the way. As you walk in this next section, parts of the highway will start smoking and then fall out from under you. They are easy to recognize, being a different color and often being in the form of a single piece of highway hanging off the edge. Oddly enough, you can wall climb them without them falling apart. You'll come across two more types of flying enemies. The first is a Bomb Been, the other is a Jamminger. A wasp like robot that just flies horizontally. Purple and similar in appearance to the Crusher robots with the spikes underneath. The Jamminger enemies are slow, but will follow you around and do whatever they can to hit you with their spikes, then laugh if they land a hit (perfect time to shoot them to bits as they let their cockiness get the better of them). They don't shoot anything, so take the time to blast them while they appear. The way they are programmed is such that when they appear on screen, they will fly towards a designated spot, then wait a moment before attacking you. The last type of enemy you'll come across is a group of Road Attackers, robots driving cars. Just fire quickly and you'll blow off the robot, but the car he was driving will still be running. You can jump onto the car and ride it, but make sure it's going in the right direction! The cars can only turn if there is a robot driving them (jump over one, wait for it to turn, then kill the robot and ride it if you want). Keep blasting the Road Attackers until the boss fight starts; remember that you can also ride on the cars. Near the end of the Highway Stage, a long flat stretch with lots of Road Attackers, you'll see a massive warship, the Death Rogumer, floating above you, dropping all these Road Attackers from a loading dock. Run to the far right edge where the screen ends, and just take out cars while you wait. After destroying around four or five cars, the Death Rogumer will suddenly cease Road Attacker deployment, and the stage music will turn ominous. It appears you've drawn the attention of a more powerful Maverick to come out and fight you personally... A helmeted, purple robot in a dark-colored battle suit of Ride Armor will descend from the loading dock. This is Vile (original name: Vava), a Reploid who suffered a cranial short-circuit that twisted his personality something fierce. Shortly after this, Vile went renegade and became a Maverick working for Sigma. Vile is considerably dangerous and one of the most frightening cases of cataloged Maverick outbreak. He isn't just your common household robot: he is a war machine, filled to the brim with combat weapons designed to bluntly kill anything that establishes itself as an enemy. Unfortunately, Vile changed into a sociopath who doesn't care who gets blown away in the ensuing firefights; in fact, he's thrilled if such things happen. The Maverick's got a whopping penchant for carnage like you wouldn't believe. 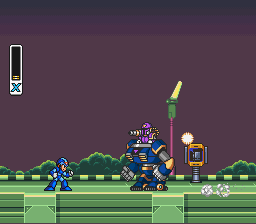 You cannot win this fight, so just have Vile defeat you with one of the glowing yellow projectiles. This is a storyline battle, so you can't "win" (Vile is invincible). He will race towards you with his Ride Armor treads and throw punches repeatedly. Once your energy meter drops below a certain point (around four energy bars), Vile will start shooting glowing yellow orbs at you that entrap enemies in an energy net. If you get hit by one of these projectiles you'll be trapped and both the fight and the level will end with a short cutscene. Keep in mind that if you're hit enough times before being trapped by one of the glowing orbs you can still die; so to fight against this boss safely, throw yourself at one of the orbs to end the battle as soon as possible. Vile almost got a taste of his own medicine. The Maverick lucks out and escapes Zero's second Buster strike. 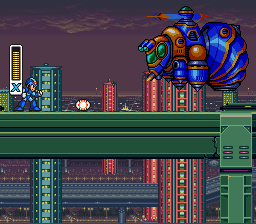 When X is trapped in an energy net, Vile will advance to X and grab him with the giant fist of his Ride Armor, binding him in a hopeless death grip. Vile: "You worthless piece of scrap metal, did you think you could defeat me?" Without warning, the charge of a Buster weapon is heard from the background. Moments later, it fires, and a burst of blue energy rips into the shoulder bracket of Vile's Ride Armor, tearing off its left arm, which frees X from capture. A Reploid clad in red armor with a blond trail of hair flowing out of his helmet dashes into view. It is Zero, an A-class Maverick Hunter, here to rescue his partner and close friend. Vile is spooked by the sudden dismemberment of his Ride Armor and realizes he has lost his advantage. 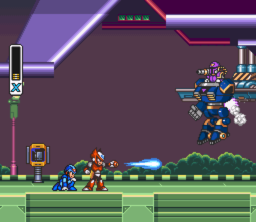 The Maverick immediately retreats back into the Death Rogumer, seconds before Zero is able to let off a second attack. Zero watches as Vile escapes for the time being, and then turns his attention to his injured partner. X: "I guess I'm not powerful enough to defeat him..."
Zero: "X, you shouldn't expect to defeat him, he is designed to be a war machine. Remember, you have not reached full power yet. If you use all the abilities you were designed with, you should become stronger... You may even become as powerful as I am. I'll scout ahead and collect as much information on Sigma's fortress as I can. I'll meet up with you when you get there. See you later! X, I know you can do it!" 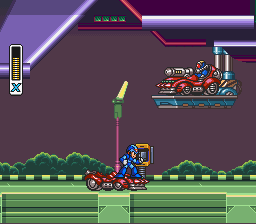 Zero teleports out of the Highway Stage, and X soon follows suit. This marks the conclusion of the first stage, and now you can start progressing through the main section of the game: infiltration of several tactical strongholds where Mavericks following out Sigma's rebellion are stationed. It is time to liberate them from Maverick control and reclaim peace! 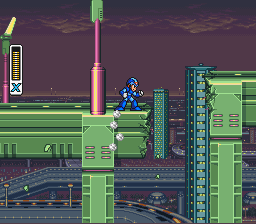 Your reward for finishing the stage is the first password of the game, which will let you bypass the Highway Stage if you enter it from the main menu. Each time you complete a level, collect a permanent item, or acquire an upgrade the password will change. This page was last edited on 10 May 2018, at 08:55. This page has been accessed 34,628 times.